The Meritage Resort and Spa in Napa Valley California is one of our favorite locations for photographing weddings. The Meritage is one of four resorts currently located in California These resorts include, Estancia La Jolla located in La Jolla, California, and the Balboa Bay Resort of Newport Beach. The Meritage seems to have something for everyone. Along with a beautiful pool, spacious rooms and vineyards the Meritage is a wonderful location to have a wedding. Located in Napa Valley near many of Napa Valley's famous wineries the Meritage offers beautiful amenities. Alexa and Jake chose the Meritage Resort and Spa to have their April 17th wedding. At this time of year the hillside behind the Meritage property, which is usually dry, is green and lush with vegetation. This hillside is located just behind the vineyard and very near the Meritage wedding ceremony site, which is also on a hill over looking much of Napa. To actually get to the hillside couples must be limber enough to slip under a white three rail fence. Not all couples are willing to do this in their wedding clothes. For the couples that are willing to exert themselves, beautiful pictures are our reward. Alexa and Jake were one of those rare couples that were very excited to capture beautiful pictures. When asked if they were willing to climb under the fence Alexa and Jake jumped at the chance. In the image above you can see Alexa came prepared wearing her high top Converse sneakers. Sneakers were not something she really needed because Jake was more than happy to carry his lovely bride.In the image Jake makes carrying Alexa appear effortless. Photographed from a distance using an ISO of 200 and an aperture of 4.5 the image was captured on a Canon Mark 3 camera with a 70mm to 200mm 2.8 lens. 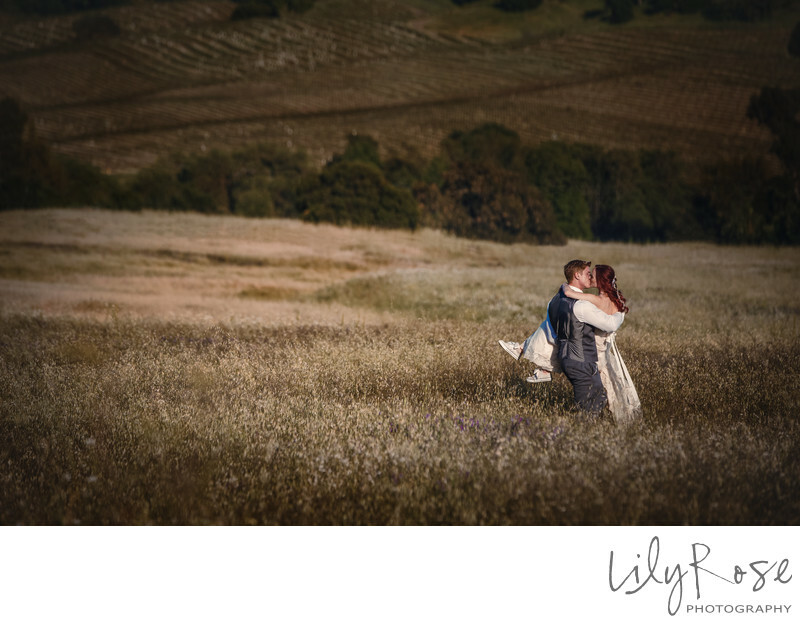 Although a series of pictures were taken this image captured just the right moment as the couple gracefully walked through the field. The warmth of the sun creates a feeling of love and tranquility through the picture. Jake's kiss is not only natural and romantic in the image but through Jake's body language you get a feeling of just how willing he is to protect his new bride. Alexa's body language expresses just how willing she is to have the strength of Jake embrace her. How lucky we were to be there to capture this moment. After this photograph was taken we directed our couple to walk hand-in-hand towards us and we were able to capture another series of beautiful images. Having finished our work in the field we directed our couple back towards the fence, climbed under and proceeded to do some more traditional posed wedding photographs. Left with the excitement of having captured a really remarkable image for our client we were anxious and excited to see our image on a computer the next day. Location: 875 Bordeaux Way, Napa, CA.